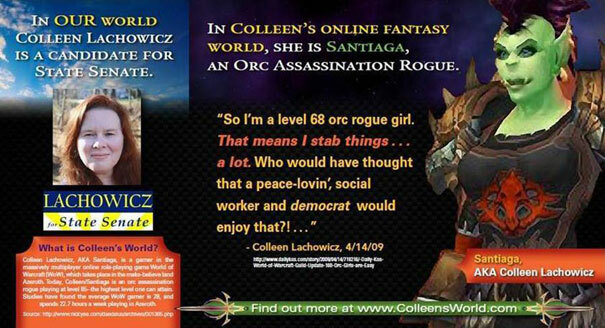 The Maine Republican Party has started a witch hunt against Maine state Senate candidate Colleen Lachowicz based on the fact that she is actually an orc assassination rogue. To be more precise, the Senate candidate plays as a level 85 orc assassination rogue in World of WarCraft. Lachowicz has not made any effort to hide the fact that it is a World of WarCraft fan. In fact, she has blogged about it several times in its political column on DailyKOS.com. But that didn’t change the state GOP’s mind. “We think anyone making comments about drowning Grover Norquist and stabbing things shows a shocking level of immaturity and poor judgment that voters should know about,” Maine GOP party spokesman David Sorenson said, referring to a blog post by Lachowicz where she joked about enjoying stabbing things in World of WarCraft. “Certainly the fact that she spends so much time on a video game says something about her work ethic and, again, her immaturity,” Sorenson added. According to her website, Lachowicz has a master’s degree in social work and runs the school-based programs for a statewide mental health center. Scary that she runs programs for schools in mental health, but is addicted to world of warcraft. Poor kids imo. So more than 10 millions of WoW players, plus dozens of millions of other mmorpg players in the united states are seen as Immature Bizarre Double Lifers from republicans.. what a nice way to get votes. Oh Republican party how socially & intellictually superior art thee! Please have mercy on the foolish man when your "Lord" elevates you to your rightful place above, for we know not what we do. Forgive us for our sins. Many of us are so illiterate we don't even know how to read the part in the Bible where it says that video gaming is a sin & I don't think Jimmy Swaggart or Creflo Dollar or Ted Haggard (or any of the other reputable televangelists) have covered it in their sermons so please have mercy on us! The immaturity of a video gamer. We fall so short on the whole maturity scale as compared to religiously motivated politicians who think the entire Universe is 5000 years old & in the hands of their omnipotent imaginary friend. assassin? no. rogue? nope. orc? yes. just another person playing WOW nothing new here. And I'm a mass murderer because I play Hitman. Geez.